It is not just the hybridisation of the wheat grain that has caused extreme increases in illness today; it is also the lack of traditional preparation. Yes, the modern hybridised wheat grain (triticum aestivum) can barely even be called wheat due to the huge alterations that have occurred. So even if the wheat is traditionally prepared, it is still likely to cause vast amounts of inflammation within the body. However, when you use ancient, traditional wheat grains that have been cultivated for thousands of years, it can be a beneficial addition to your diet. We recommend that you still don’t use these wheat grains if you have coeliac disease or are healing from an autoimmune disease. In saying this, a recent study has shown that nontoxic flours that have been fermented for a long time and are then made into bread which includes particular lactobacilli strains, may enable coeliac patients to enjoy bread again. Now this is exciting news. It must be noted that everyone is an individual and will respond differently. What is incredible is that the first wheat cultivated (einkorn) was found in the intestinal tract of one of Europe’s oldest mummies, known as Otzi the Iceman back in 300 BC. Einkorn, meat fibres and herbs were also discovered. Grains are not meant to be eaten plucked straight from the fields, as they are coated in naturally occurring toxins, such as phytic acids that the human body cannot digest efficiently and often causes bloating, gas and inflammation. The fermentation process of sourdough making eliminates these phytic acids, provided that it is given the right environment. This not only provides us the ability to digest the grain, it also enhances mineral bioavailability, particularly magnesium, iron and zinc. Through the fermentation process of the wheat flour, the bacteria eat up the carbohydrates within the flour, leaving the final product with minimised carbohydrates. 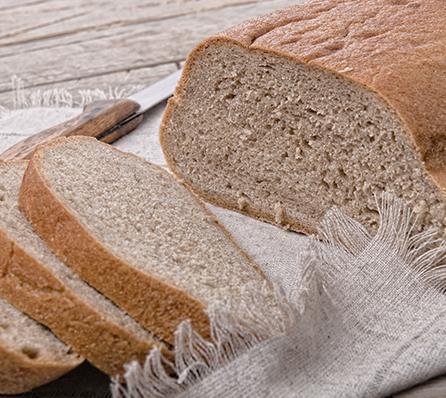 This fermentation process has been shown to be tolerated by those with impaired glucose metabolism, particularly if the bread is leavened with lactobacilli bacteria. Hence sourdough bread is created. You can read more about the history of sourdough here. To make your own sourdough bread, there are a couple of different options. You can either make it with a pre-made sourdough starter or you can make your own sourdough starter. The Nourished Kitchen have outlined how you can create your own sourdough starter here. I wanted to experiment in making my own sourdough bread, which was wholesome, nourishing and traditional. The main aim was that it could be enjoyed by many without the harmful effects of modern wheat that is not fermented. I used Emmer wheat and a coconut water kefir starter to ferment the wheat. The result was amazing and of course it was more dense and ‘doughy’ than modern wheat as there is less gluten. Emmer wheat is closely related to einkorn, being the second wheat cultivated after einkorn not long after. Typical sourdough recipes say to use the flour to coat it before baking and after fermenting – I chose to use coconut flour as the emmer wheat flour would therefore not have gone through the fermentation process. In a bowl, jar or glass container, add the flour, salt and kefir and stir through until it is well combined. Cover tightly either with glad wrap if you are using a bowl, or seal it with a lid. Allow it to sit for 12 hours or overnight in the warmest area of your house, until it has doubled in size and has air bubbles throughout the mix. Scoop out the mixture (it will be really sticky) and dust with coconut flour slowly until it forms a dough and is no longer really sticky. Line a loaf tin with baking paper and even out the mixture. Place it in the oven at 80-100oC until it has risen once again. This will take 20-30 minutes. (Important: need to ensure the dough has risen in the tin before proceeding to next step). Turn up the heat to 200oC and bake for a further 40 minutes or until it is golden brown. What a lovely recipe. Is there any substitute for the coconut water keffir? I would love to make this for my children. I do have the kefir but I myself can’t eat bread so it would a shame to use it all up on the bread. Hi Verity, you could use a different starter as there are plenty out there. I use kefir as it works beautifully and is clear and will not change the outcome of the product. Enjoy! What brand of coconut kefir do you use ? Hi Sheridan, can you do this with gluten free grains ie buckwheat, quinoa, amaranth, millet? I make a fermented bread with buckwheat and quinoa but would like to try this using a mixture of grains. Hi Susanne, Yes that would be completely fine! You can ferment anything you like. Follow the same process, ensuring you allow it to rise when it is in the loaf tin as that is very important to get a great rise in the bread. Enjoy!